Would you go see a kidney specialist for a pain in your toe? Probably not. Well, the same concept can be applied to chiropractors. The approaches some take work better for certain conditions, while the approach others take work better for other problems. Some chiropractors get really good results treating migraine headaches, but maybe not so much with low back pain. Others are fantastic at treating sciatica but don’t have much success with peripheral neuropathy. Some chiropractors like to work with sports injuries, while others focus on wellness or family care. Some do a little bit of everything, kind of like a general practitioner. I guess the reason so many different chiropractors are good at different things is that there are so many different chiropractic techniques. There are some chiropractors, called “upper cervical practitioners” who only adjust the first two vertebra of the spine – they usually have great success with things like headaches and dizziness (although I personally had a case of lower back and leg pain that I couldn’t shake until I had a fantastic upper cervical adjustment). Other chiropractors use techniques like Cox flexion/distraction which works well with lower back disc herniations but doesn’t do much for neck pain. Some chiropractors adjust people very aggressively while others use techniques that use a very light touch. 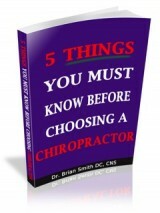 The key is to find a chiropractor who has had good results with the type of problem you’re having. The chiropractor who is the best in the world at helping people with headaches may not have much luck with low back pain. You need to find out what they are good at, what conditions they like to treat. Personally, I like to help as many people as I can, so I have had training in several different techniques. I use various approaches such as Diversified Technique for neck problems and Thompson technique for lower back problems. Because I see so many seniors with arthritis, I also use computerized adjusting instruments that deliver a light touch but are very effective in cases where an manual adjustment would probably be too aggressive. I use low level laser therapy to stimulate healing, and sometimes electro-therapy for nerve and muscle stimulation. I’m also a certificate holder from the American Functional Neurology Institute, which uses brain based therapies to help many conditions. I’ve also taken the time and effort to become a Certified Nutrition Specialist because I know that some of my patients’ conditions can be helped with proper nutritional supplementation and dietary modifications. This doesn’t mean I’m better than other chiropractors, just that I’ve been trained in many different techniques so I can apply the one that I think will work best for my patient. There is no “One-Size-Fits-All-Everyone-Gets-The-Same-Treatment-No-Matter-What-Their-Problem-Is” in my office. If you would like a complete copy of this eBook, please email me at drsmith@southernoceanchiro.com and I will gladly send it to you in pdf from.